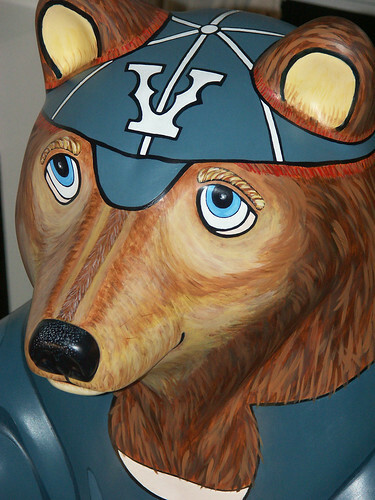 Bob Brown Bear, originally uploaded by baseballart. Maktaaq has already blogged about the Spirit Bears [sb] located around Vancouver [mbv]. Nay, not blogged but raged against the art machine that created the individually painted bears positioned around town. Meanwhile I pass one on Cordova by Canada Place every night on my way from the Waterfront Skytrain Station home after work. I try to give it a high-five, unless there’s a bit puddle in front of it, because you know it’s just standing there with its arm out asking for one. And you can’t high-five a real bear can you [cn]?